HAS LIFE'S DIFFICULTIES LEFT YOU FEELING RUN OVER? How would you like to break free from these confinements so you can experience life with renewed confidence, move forward and step into a brighter future? Have you ever felt like a victim, trapped in circumstances outside of your control? Do you feel like life is happening to you without your consent? Tired of the emotional roller coaster that saps all your energy and poisons your relationships? Yes, you can take your life back! I’m Linda Bucher, Master Certified Life Coach, Mentor, Author and Speaker, and I’m so excited to offer you an amazing program that will transform your life. And, I promise, if you do the work, you will understand how to take back your power in such a healthy, life-affirming way, that ALL areas of your life will change for the better. And I’ll be with you, supporting you every step of the way. I know you’ve faced some pretty big obstacles in your life. And they seem to keep on coming. But you soldier on. You always soldier on. You’re SO tired of trying to keep a smile on your face, of keeping up the façade of “everything’s okay”. This is a normal reaction when you feel buried by circumstance. I get it. I’ve also faced adversity. These are some of the events in my life that led me to a very discouraged perception of myself and my world. Until one day, when a light bulb moment came to me. An epiphany. And that's what I'd dearly love to help you do; make positive changes that will help you cope with whatever comes your way – WITHOUT ever having to fall into victim mode again. It's time to break free of the emotional chains that bind you to your past! Power Shift will help you transform from being a spectator to being the CREATOR of your life. You need to do that gently. And preferably with the guidance of someone who's been there. 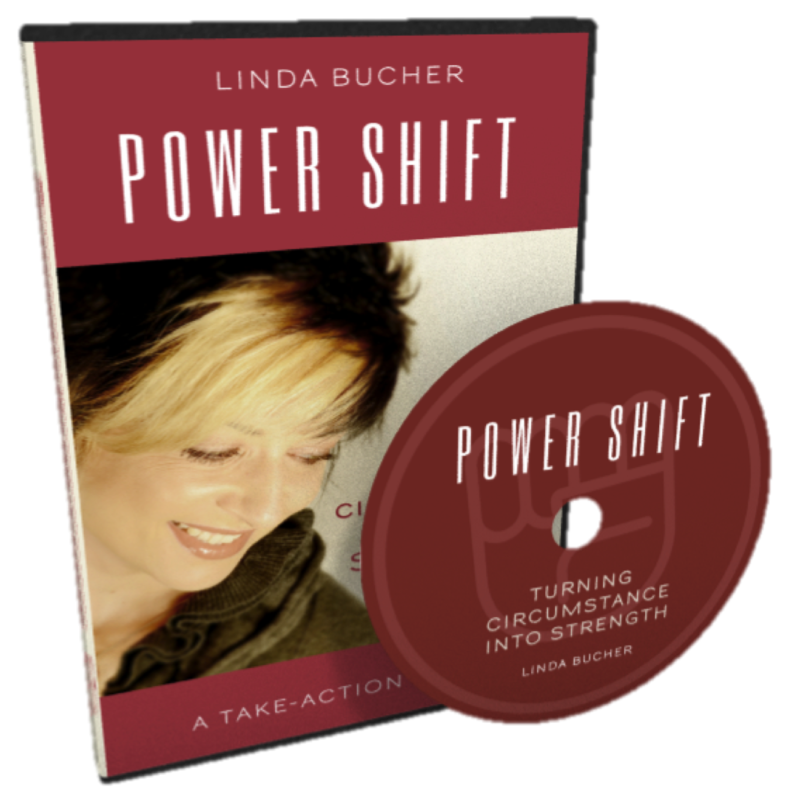 Power Shift is a take-action guide for people who want to release themselves from the emotional distress that comes from experiencing negative events that are outside of their control. It's all about taking control back in a healthy, vibrant, self-enhancing way. The program is based on my own personal experiences and fused with my coaching expertise. I’ve guided hundreds of clients through this transformation with amazing results. Power Shift is changing lives! I went from feeling like a prisoner in my own life to having a renewed sense of self. After so long of feeling out of control, I finally have what I need to take the reins." Before going through Linda’s program, I was just going through the motions and, frankly, I was feeling sorry for myself. Now I feel the confidence to move forward with my life in a whole new light." I didn’t even realize how I had been viewing my life – as a tragedy. Through Power Shift, I discovered that I am quite the hero. I now feel as if I have gained the confidence and strength I needed to create the changes I want in my life." I see the past so much more clearly after having gone through Power Shift. Now, I’m looking forward to my future like I haven’t in years." Some programs are all how-to and no action. Power Shift is different. Approaching life like a hero, feeling like a powerhouse, as you navigate through the ups and downs of life with confidence and poise. If this is what you’re after, then it’s time for a Power Shift! First, you’ll get the Power Shift Guide, a PDF complete with 3 short videos demonstrating exactly how to break free from that feeling of imprisonment. The remainder of the guide will you through that process, step by step; helping you break out from the imprisonment of your past and taking you through a journey like you’ve never known. A few days later, you’ll get a bonus worksheet to begin mapping out your future. After that, you’ll get an assessment tool that will help you plot your coordinates so you can determine exactly where you stand. Finally, based on your assessment results, you’ll receive a personalized report of the best next steps to take as you move into your future. Can you imagine a huge weight being lifted off your shoulders? Isn't getting your life back worth a few hours of your time? Start making your Power Shift today and begin to live life again - on your terms.